The structure of our daily life was based on Louise’s tube feeds because she was fed the whole night and 3 times/day for half an hour each. We rarely left the house because we had to carry the whole tube equipment with us.. The alarm of the pump regulated our sleeping rhythm because Louise stopped the feed when she moved in her sleep. We liked the activities very much, they gave us insight in the situation of our child and helped us understanding her problems with orality. Yes, we felt really very comfortable, the atmosphere was very familial, the team listens very carefully, the meet us on eye level and are always available. They adjust to each child’s needs, they see everyone as an individual and provide personalized recommendation. 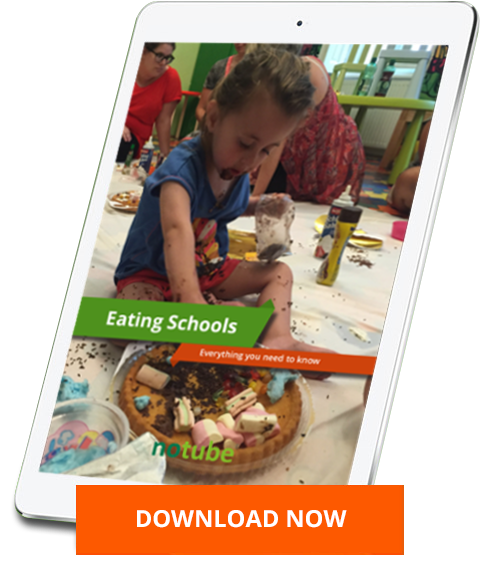 Louise is now tube free and eats the whole day, something one could not even imagine before the Eating school. This therapy has initiated something in Louise because now she brushes her teeth and tries to speak more and more. Furthermore, Louise sleeps much better without the tube because she has no reflux anymore and must not digest during the night. What a joy to see her getting up without the tube! The best moments are to see her eating joyfully each day, to feed her, to see her thriving and feeling better and better. To hear her saying “Yes” when one asks her if she likes something to eat and to see her sitting at the table and complaining if she doesn’t get the food fast enough. We wholeheartedly thank the NoTube Team for their recommendation, their kindness and knowledge. Thanks to them, our life has completely changed! Off to tube-free trips!